In a couple of previous posts, I’ve been trying to make changes to the Ranger ‘Beast Master’ archetype, after bitching about how rubbish the ‘official’ update was. This is my (probably) final version. My thinking is that the beast should be allowed to take actions at the same time its Ranger can – after all if a wizard’s familiar gets its own turn, why should an animal companion just stand there like an idiot when not given orders. So I’ve had the ‘Beast’ take its turn for the Ranger’s bonus action. It also shouldn’t do much more damage than a typical character’s off-hand attack, which also normally takes up a bonus action. Of course the problem with it is it then ruins a Ranger built for two-weapon fighting, who has to choose between attacking with his off-hand and giving his Beast a turn. What the Beast really adds to the character is versatility – your beast can help with tracking, do more varied things in combat (help, shove, etc), and at later levels can apply nice statuses to enemies. This version also gives the player a lot of options as to how they want their beast to turn out. A tough, highly armoured bear? A stealthy panther who can pounce on enemies? A poisonous frog that can walk on the ceiling? Whatever you like. Massive credit to reddit user bluegobln, who came up with a lot of the ideas for this. Obviously I prefer my slightly tweaked version, but theirs is definitely worth checking out. When you choose this archetype at 3rd level, you gain a beast companion that accompanies you on your adventures and is trained to fight alongside you. Through your bond with the beast you have suppressed its baser instincts and gained its unwavering loyalty. Choose a beast that has a size of Medium or below and a beast stat block (see below) appropriate to its type (DM’s discretion). Your beast companion is proficient in Dexterity saving throws and one other saving throw of your choice. Add your proficiency bonus to its saving throws. Add your proficiency bonus to the beast’s AC, attack rolls, ability save DC, and any skills it has proficiency in. The beast has proficiency in the Wisdom(Perception) skill. 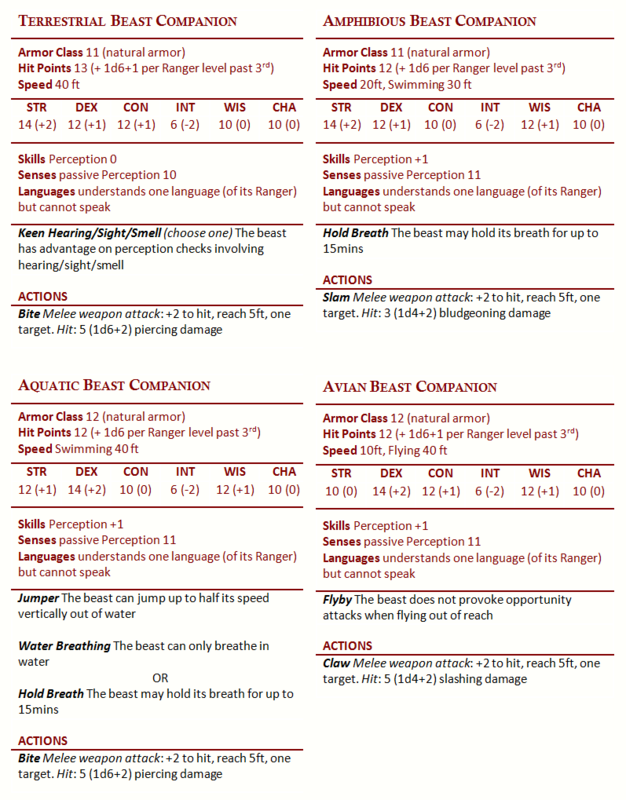 Your beast has 1d6 hit dice per ranger level. These may be used for healing during a short rest as normal. The beast takes its turn on your Initiative. On your turn, you can verbally or somatically command the beast where to move, as long as it can see or hear you (no action required by you). As a bonus action you can command your beast companion to take an action. While traveling through your favored terrain with only the beast, you can move stealthily at a normal pace. If you are incapacitated or absent, your beast companion acts on its own (i.e controlled by the DM), focusing on protecting you and itself. It never requires your command to use its reaction, such as when making an opportunity attack. If the beast dies, you can obtain another one by spending 8 hours magically bonding with another beast that isn’t hostile to you, either the same type of beast as before or a different one, and you may choose new Magical Bond and Exceptional Training bonuses for it. As an aside, I’d also give the Hunter archetype a non-magical companion. I’d make it basically the same as the wizard’s familiar, but without the telepathy (maybe spell delivery? ), and allow it to attack. I’d also allow a wider range of creatures, to include any beast challenge 1/8 and below. Athletic – your beast gains proficiency with the Strength(Athletics) skill. Stealthy – your beast gains proficiency with the Dexterity(Stealth) skill. Acrobatic – your beast gains proficiency with the Dexterity(Acrobatics) skill. Survivor – your beast gains proficiency with the Wisdom(Survival) skill. Alert – your beast gains expertise with the Wisdom(Perception) skill (add double your proficiency). Speedy – your beast’s Walking, Flying, or Swimming speed is increased by 10 feet. Keen Senses – your beast gains one of your choice of Keen Smell, Keen Sight, or Keen Hearing. Camouflage – your beast has advantage on Dexterity (Stealth) checks while in your favored terrain. Spider Climb – (Requirement: Lizard, Spider, Frog) your beast can climb difficult surfaces, including upside down on ceilings, without needing to make an ability check. Pack Tactics – your beast has advantage on attack rolls against creatures as long as at least one of its allies is within 5 feet of the creature and the ally isn’t incapacitated. Mimicry – your beast can mimic a simple sound it has heard. A creature that hears the sound can tell it is an imitation with a successful DC 10 Wisdom(Insight) check. Sure-Footed – your beast has advantage on Strength and Dexterity saving throws made against effects that would knock it prone. Leap – (Requirement: Standard or Amphibious beast companion) your beast can long jump and high jump up to half its speed without a running start. Beast of Burden – your beast can carry double its normal carrying capacity. Pounce – your beast may make a Pounce attack. If the attack hits it deals the beast’s normal damage and if the target is a large or smaller creature it must make a DC 10 Strength saving throw or be knocked prone. Poisonous – your beast may make a Poisonous attack. If the attack hits it deals the beast’s normal attack damage and if the target is a creature it must make a DC 10 Constitution saving throw or become poisoned. Roar – your beast may use its action to let out a fearsome roar. One target hostile creature within 20ft of the beast must make a DC 10 Wisdom saving throw or become frightened until the beginning of your next turn. Ferocious – your beast companion may attack recklessly, giving the beast has advantage on its attacks while any attacks made against it until its next turn have advantage. Rampage – When either you or your beast companion reduces a creature to 0 hit points, the beast can use its reaction to move up to half its speed and make an attack. This ability may only be used once per turn. Enchanted – Your beast’s attacks count as magical for the purpose of overcoming resistance and immunity to non-magical attacks and damage. You may choose a bonus you have previously chosen and apply the same bonus again (if applicable). Your beast may achieve double proficiency (expertise) in a skill, but no further. At 11th level, choose another bonus to apply to your beast from the Exceptional Training or Magical Bond lists. You may choose a bonus you have previously chosen and apply the same bonus again (if applicable). Your beast may achieve double proficiency (expertise) in a skill, but no further. Whenever you take the Attack action you can forgo one of your attacks from the Extra Attack feature in order to allow your beast companion to make one additional attack instead. Beginning at 15th level, choose another bonus to apply to your beast from the Exceptional Training and Magical Bond lists. You may choose a bonus you have previously chosen and apply the same bonus again (if applicable). Your beast may achieve double proficiency (expertise) in a skill, but no further. When you cast a spell targeting yourself, you can also affect your beast companion with the spell if the beast is within 30 feet of you. Your beast companion’s attacks may be considered your attacks for the purpose of triggering on hit effects, such as the damage effect of Hunter’s Mark. I’m quite happy with the version I have now, I’d play as one or allow it in a game I was running. I feel it balances reasonably well with other classes, although the beast is powerful and gives the Ranger an extra attack/action, it’s also killable. Having half your class features fall unconscious would certainly make most players nervous! If anyone wants to print the archetype out and keep it (who wouldn’t, it’s amazing) a pdf link is here. Is there a pdf of this somewhere? Nope, but I’ll make one and add a link. Radical. I like the way this Ranger looks. Thanks! Try it out, let me know how you get on. Pdf link is now there.